Gathering and sharing food are ways for people to celebrate their culture and come together in community. 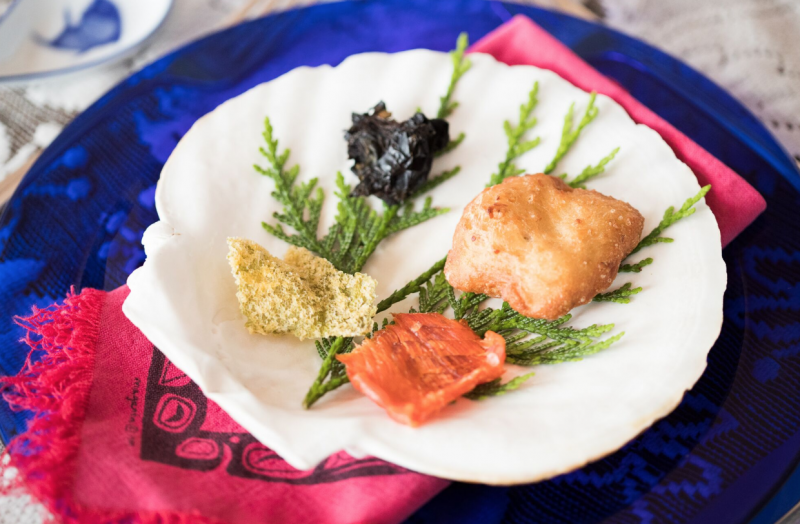 Indigenous-inspired food experiences in British Columbia provide non-Indigenous foodies a chance to discover traditional ingredients – from venison to oolican – in atmospheres created by those that honour the culture they share. With the growing interest in immersive Indigenous tourism experiences and locally-sourced, wild-harvested food, Indigenous restaurants are on the rise. Take a seat at a timeless and contemporary table where eating is learning and every morsel is a connection to the land and its people. 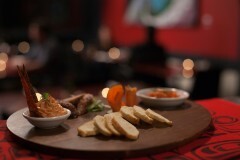 Located in the traditional Coast Salish Territories of the Musqueam, Squamish and Tsleil Waututh First Nations, this celebrated and casual restaurant is currently rated tenth out of more than 3000 restaurants in Vancouver. 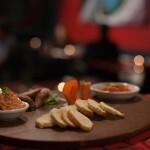 Co-owner Inez Cook of the Nuxalt First Nation does her best to procure fresh ingredients from First Nations suppliers. Saskatoon berries and soapberries; stinging nettle and sea asparagus; birch syrup and cedar jelly; caribou and salmon all make appearances on the menu of this small but always packed restaurant. Reservations are highly recommended. Husband and wife co-owners Sharon and Darren Bond-Hogg reassure guests: “Don’t panic…we have bannock!” The café was named by Sharon for the kekuli (say ke-koo-lee) a traditional Indigenous winter dwelling built half into the ground and made of logs, tule, dirt, and grass. The traditional and gourmet bannock delights are made fresh daily at locations in Merritt and Westbank, Kelowna and they have a gluten-free version. Their famous frybread is always vegan and is the glorious, golden centrepiece in Breakfast Bannockwiches and Venison Flatbread Tacos. This friendly coffeehouse environment showcases Indigenous art and music and hosts an open mic night. Lelem’ (say lay-lem) means home or place to come together in hən̓q̓əmin̓əm, the language of the Kwantlen people. Situated on a low bank of the Fraser River in the historic village of Fort Langley, the Lelem’ Arts and Cultural Cafe showcases arrowheads, tools, and other artifacts found on traditional Kwantlen land – some more than 5000 years old! Menu options, like venison sliders and sockeye salmon chowder, make use of locally-sourced elements of a traditional Coast Salish diet. The bright, cedar-rich cafe hosts Indigenous cultural workshops and features live Indigenous music performances on the first Saturday of each month. Trend meets tradition at Mr. Bannock – Vancouver’s first Indigenous food truck. Mr. Bannock is a second-generation Squamish Nation cook, Paul Natrall. Inspired by his great grandfather, who was an army cook, Natrall is proud to share his vision of Indigenous street food and Indigenous fusion cuisine – all from a big red truck. The affordable menu includes Natrall’s award-winning bannock tacos and a creative Indigenous twist on chicken and waffles: juniper dry-rubbed chicken on waffle bannock. Mr. Bannock caters events and tours around. To find out where and when you can line up for this popular fusion Indigenous cuisine, visit @MrBannockFood on Twitter or Facebook. Keenawaii (Roberta Olson) is proud to serve wild-harvested and local food gathered in Haida Gwaii by her family from her home kitchen in Skidegate. You might enjoy venison with wild cranberries or fresh halibut with root vegetables in a multi-course exploration of Indigenous cuisine. David Suzuki and the Princess of Japan have both been guests. Sitting oceanside in Roberta’s kitchen, you can try sguu (dried seaweed), K’aaw (herring eggs on kelp), and gilgii (dried salmon). 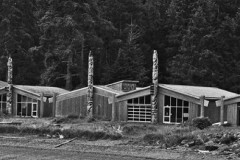 She can serve a traditional Haida feast for two to twenty-five guests, but reservations are required. You will be served by Keenawaii’s family and hear all about the short distance from the sea to your plate. This is not a restaurant–this is Keenawaii’s home. Touring British Columbia’s northwest coast? Travel along the beautiful Nisga’a Highway and visit “U” Seefood, “U” Eat It – a seafood restaurant located in the Nisga’a Village of Gingolx in Nass Valley. Owner and host Bonnie Moore has expanded a catering business (U Seefood Services) to include this diner that serves crisp, lemony halibut and fries, bowls of chowder, and buttered crab. This little spot is a popular stop for a seafood sampler when passing through the community of Gingolx: Seafood Capital of the Nass. 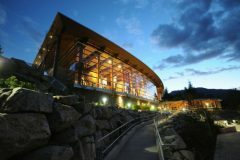 The Squamish Lil’wat Cultural Centre in Whistler is home to The Thunderbird Cafe and its modern Indigenous cuisine. This is a place of cultural sharing where you can take part in interactive workshops and tours hosted by members of both Squamish Nation and Lil’wat Nation. After you weave a cedar rope or make your first hand drum, you can head to the comfortable Thunderbird Cafe. Ask the Cafe Cultural Ambassadors questions about local culture and your food as you enjoy people-pleasing menu items like cedar plank sockeye salmon salad or venison chili with traditional bannock. 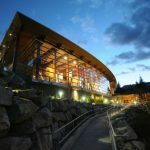 Located at the award-winning Haida Heritage Centre at Kay Llnagaay, the Kay Bistro’s food draws diners–ones that aren’t just there for the primordial Haida Gwaii mists and opportunity to learn about the local Indigenous culture. 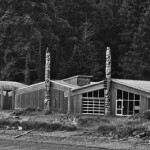 Kay is traditional Haida language for sea lion. This bistro is a traditional bistro; the croissants are from scratch.The menu is flexible enough to take on scratch recipes with fresh, wild-harvested food and it consistently delivers people’s favourites, like buttermilk fried chicken on a brioche bun. The menu items are not all traditional Indigenous foods but ingredients like halibut, wild greens, root vegetables, Haida Gwaii spring salmon, and fresh herbs are harvested close to home. Honouring place and sustainability are essential Indigenous teachings. The traditional territory of the Syilx (Okanagan) people is home to Indigenous World Winery – an Indigenous-owned winery. Indigenous World offers a view of rolling golden grasslands, blue skies, and Lake Okanagan in West Kelowna. 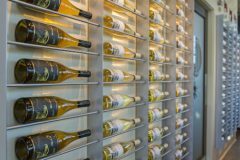 Robert and Bernice Louie own this winery that produces world-class wine, like award-winning white blend Hee-Hee-Tel-Kin (2017 San Francisco International Wine Competition). 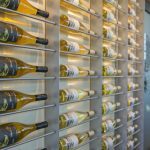 The passionate, knowledgeable crew offers private wine tastings in a traditional teepee paired with charcuterie and Indigenous-influenced food from the on-site restaurant, The Red Fox. The Quaaout Lodge & Spa is located in traditional Secwepemc Territory in the community of Skwlax. Unwind with a round of golf, gather at the kekuli-inspired conference center, or sink into a massage treatment at Le7ke (Say la–pause–ka. It means “I am good.” in Secwepemctsin) Spa. When your restorative day is done, visit Jack Sam’s for authentic Indigenous ingredients and gourmet dinners that include bacon-wrapped venison tenderloin with berry jus and elk stroganoff with fresh pappardelle. The location has a panoramic view of Shuswap Lake and the surrounding snow-capped mountains. Little Shuswap First Nation invites you to enjoy and preserve the beauty that has been their home since time immemorial.